Bonnie 32cm Porcelain Doll (SOLD) wears a very pretty liberty floral dress under a white pinafore with cotton lace accents. Underneath she wears a white cotton bloomers and red patent slippers. Short titian curls frame her lovely face which has blue eyes and she carries her very own jointed bear! Finally, Bonnie 32cm Porcelain Doll was released in 1999 and is number 24 in the world wide edition of 950. She is in perfect condition, has her certificate of authenticity and is packaged in her original box which has slight fading to the lid. Her original price was $199. Doll Stands are a very handy tool to help display your collection of Rag Dolls or Golliwogs. 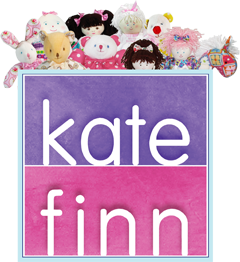 Kate Finn has four sizes available, once you have decided on a doll click on the image and the correct size stand will be displayed below ready to add to your order.